This tour is a wonderful introduction to sea kayaking. 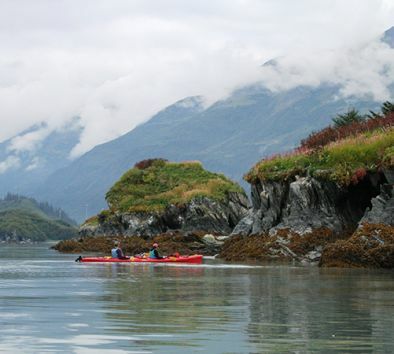 Start your kayaking trip right from the dock in Valdez Harbor and paddle along a small chain of nearby islands well known for their nesting birds and resident harbor seals. Sea lions, sea otters, pink, chum and silver salmon also frequent the surrounding area so be on the lookout! Your guide will share information about the wildlife and the natural history of Valdez. Minimum age is 6. Maximum weight is 260 lbs. Maximum height is 6’5″. Guests with back, neck, heart or mobility problems are not allowed to participate. Wear sunscreen. Bring a hat and bottled water. Dress in warm layers. Rain jackets, rain pants boots and kayaking gear will be provided. Lunch can be arranged at the lodge prior to the tour and is at your own expense. Wildlife sightings are likely but not guaranteed. Suitable for all ages, you will pilot a tandem (two-person) sea kayak equipped with all the necessary equipment you need to make this journey memorable, fun and educational. Travel time is approximately 2 hours each way. Time on the kayak is approximately 2 hours.